I had to accomplish a task today of exporting hundreds of image file names located in a few directories on my computer. Basically the client wanted a spreadsheet of the all the file names I had created. No problem I thought as I had remembered doing this a long time ago with a free software program called Karen’s Directory Printer. It would list the name of the files and/or folders of selected directories. BEFORE going looking for the program to download and install I thought, hey, it’s been years and years, I wonder if Windows has something built-in to do this. And guess what. It did. 1) In Windows Explorer press Ctrl+A to select all files in your folder. 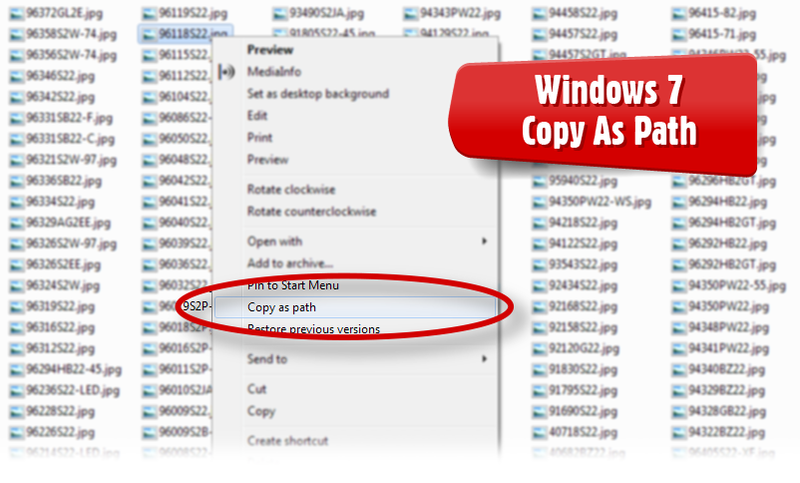 Then hold the Shift key and right-click to bring up the power user’s context menu and select the “Copy as Path” option. 2) From there you can paste the list of file names anywhere. Well actually in my case I didn’t want the whole path (ie. F:\Clients\2016\Sample\image-file-01.jpg) so I ran a “find and replace” command in my spreadsheet software to remove the path preceding the file name which was all I wanted. Additional Note: Karen Kenworthy of Karen’s Power Tools passed away in 2011. Millions of people used Karen’s software over the years. She will be missed.